Hi, I am interested in your 1968 Pontiac Firebird (stock #1310-NSH) listed on Autotrader for $64,995. I'd like to get more information about this vehicle and confirm its availability. Engine blown, mind blown. This reinterpretation of a 68 Firebird is ground breaking, ground pounding, and stunning. Check it out. Its always fun to see a blower popping up through the hood of a car. Sometimes it is more for show than go, however we assure you that in this case, it is all about getting the job done. But more about that later. 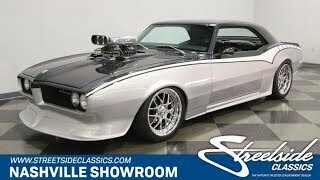 Whats wrapped around it is a creative and beautiful extension of the classic good looks of the original Firebird. Up front the split grill is accentuated by a radically extended front spoiler that is integrated into the body work and looks totally awesome! The aero rockers are also faired into the bodywork as is the rear bumper creating a nice clean look end to end. After all that custom work was done, the car was coated in a paint job that stops people in their tracks. The Black on top is complemented by Silver on the bottom with a White stripe that fades to light purple as it heads toward the back. 18 Billet specialty wheels tucked up under the fenders add the final bit of flair to the stunning overall look. Open the door and you will find a custom interior that keeps the show going. The door panel echoes the shape of the side strip both above and below the armrest. The upholstery is stitched in two-tone leather and looks especially sweet on the comfortable and supportive front buckets. The steering wheel is mounted on a tilt column and has almost a steampunk look to it in black and chrome. Behind it is a dash packed with Auto Meter gauges. The speedo and tach are set off to the sides with fuel and oil pressure in the center and water temp and voltage at the bottom. There is a Pioneer stereo mounted in the center console with speakers in the back shelf for your listening pleasure and a Pontiac arrow is set just above the power window switches with a B&M shifter for the automatic transmission just behind them. Dressed up for the show also is the trunk, which is where you may want to carry all the trophies you are likely to gather up with this car, so be sure to take a peek back there too. Ok, lets chat about whats lurking below that B&M 871 Mega blower. Pop the hood and you will see a 355 cubic inch motor setting down in an engine bay that is as nicely detailed out as the rest of the car. Everything is polished up and chromed up and looking good. The motor build started with a solid bottom end of a steel crank, 5/7 H-beam rods and Clevite bearings. Dual Holley 4-barrel carbs feed the mixture to the blower and long tube headers get the spent gasses out and headed back to Flowmaster mufflers. An aluminum radiator with dual electric fans keeps things running cool, even under pressure. Power is sent back through a 700R4 automatic transmission with all billet internals supported by a G-Force crossmember in order to handle the power. The rear axle is held in place by a 4-link system and the body held up by an Air Ride adjustable suspension, while up front, custom A-arms mount another adjustable Air Ride setup. 4-wheel disc brakes provide great stopping power and the rubber meets the road through 275/40ZR18s in the back and 245/40ZR18s in the front mounted on those Billet Specialties wheels. Engine blown, mind blown, and competition blown out of the water. Come on down and check out this awesome machine for yourself.